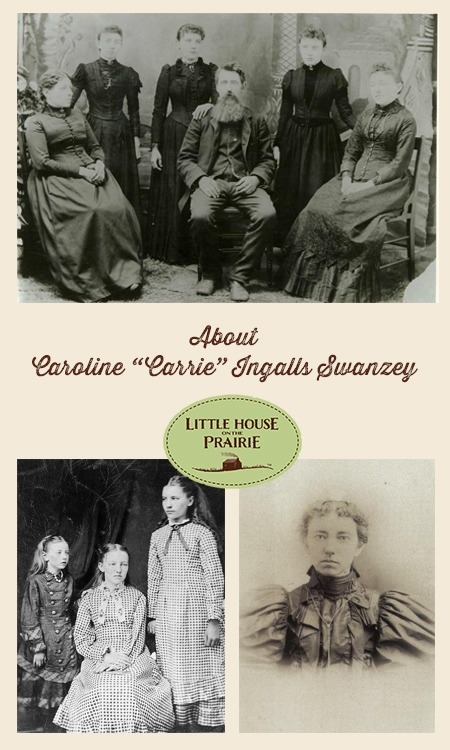 Carrie Ingalls, born Caroline Celestia Ingalls on August 3, 1870 to Charles (“Pa”) and Caroline (“Ma”) Ingalls, is best known as the younger sister of Laura Ingalls Wilder, author of the Little House on the Prairie books. Carrie is only a baby in the first book, Little House in the Big Woods, but her presence and interactions with Laura become more prominent in the later books after Mary loses her sight. 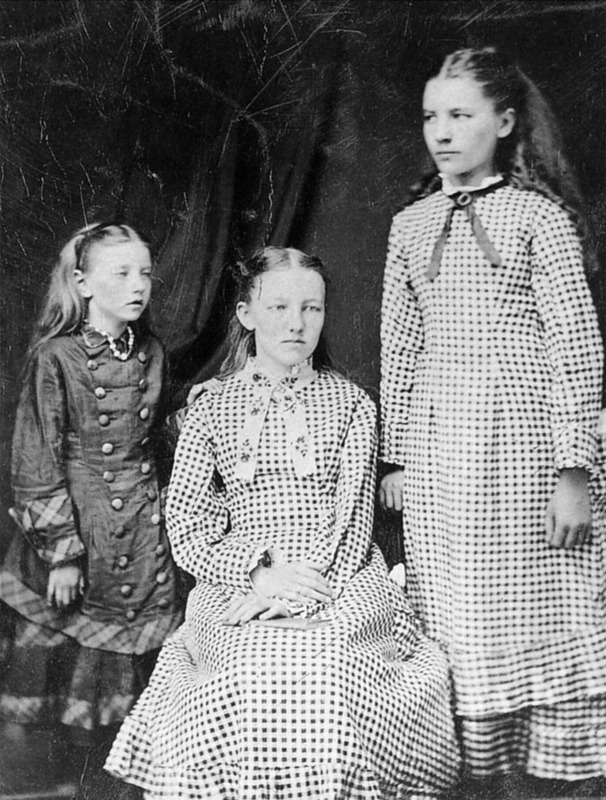 As pioneers in the late 1800s, the Ingalls family moved around a great deal – from Montgomery County, Kansas, where Carrie was born in a small cabin Pa built, to Wisconsin, Minnesota, Iowa, back to Minnesota, and eventually to De Smet, South Dakota, where Pa and Ma came to settle for the remainder of their years. Carrie spent her formative years in De Smet, passed her teacher’s examination, and became a schoolteacher for a short time though she found this not to be the profession she truly wanted. After teaching, she learned the printing trade when, at age 19, she became an apprentice on the Leader staff, the town’s weekly newspaper, which eventually combined with the De Smet News. She became a talented printer and journalist, skilled in all aspects of the trade, including melting lead into type, editing, writing, publishing, ad work and binding. Her talents eventually got her a job with E.L. Senn, owner of many newspapers in South Dakota, and this work offered her great journalistic and travel opportunities – a perk, since Carrie enjoyed travel very much. In fact, before she took this position, she had traveled a great deal, briefly living in Colorado and Wyoming, between 1905-1907, in search of a climate that would give her reprieve from her sinus and respiratory problems. 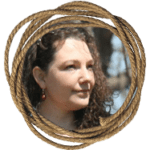 Carrie found her way back to South Dakota, feeling rested and healthier, where she won the right to take a homestead claim in Indian lands near the town of Topbar, South Dakota and lived in a small tar-paper shanty. She lived on the homestead for the requisite six months each year, and with her family in De Smet the remainder of the year. E.L. Senn began acquiring newspapers in mining areas and he sent Carrie to run them. In 1911, at the age of 41, Carrie arrived in the mining town of Keystone, South Dakota, where she managed the Keystone Recorder and worked for the Hill City Star. She would spend 35 years in this town until she eventually passed away on June 12, 1946, at the age of 76. It was in Keystone where some of the most important moments of her life took place, including meeting and marrying her husband, David Swanzey, in 1912 and raising her two stepchildren, Mary and Harold. Her sister Mary also came to live with her in Keystone after Ma Ingalls passed away. Carrie cared for her sister from 1924-1928, when Mary passed away in October as a result of pneumonia and complications from a stroke. Keystone became well known as the site of Mount Rushmore National Memorial, which features the faces of George Washington, Thomas Jefferson, Theodore Roosevelt and Abraham Lincoln carved into the massive granite face of the mountain. Carrie’s husband assisted sculptor Gutzon Borglum in scouting locations in the Black Hills and Carrie’s stepson was one of the 400 workers who transformed the mountain. 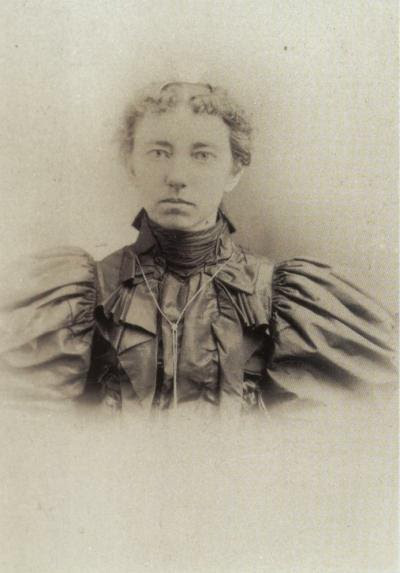 Carrie Ingalls, the lesser-known Ingalls sister, lived a rich and full life and was a strong, independent pioneer in her own right. To celebrate her life, the Keystone Historical Museum hosted an event in honor of her birthday on August 3, 2015, complete with cake, lemonade, crafts mirroring those of 1899, and a fun and festive costume contest featuring clothing worn in the late 1800s and early 1900s. Thank you for sharing! This is so informative. Down through the years I have read not only the Little House books.. but biographies here and there. I have never read this about Carrie! Thanks so much.? Love love this show! I’m a true little house on the prairie fan, every since I was a little girl! I’ve read the book and everything. I still watch the shows, and never miss it! I wish I could travel to see where they grew up together and see the church and everything! My dream bucket list! This was very interesting! I always wondered what had happen with Laura’s sisters and if they had any children. I am very involved in doing my own ancestry, so I am always curious as to the decedents of my favorite people. I had an chance to visit Mount Rush Moore once back in 2008. I am so glad to know this information. It makes my trip even more meaningful. Thank you for sharing the treasured pictures and information of their lives. It is so interesting and a life almost forgotten. I read these books as a child and fell in love with the Ingallas family. The show became one of my most favorite to watch. I never missed an episode. Now that they are on reruns I still find myself turning to watch them. They made me laugh and cry all in the same episode. I grew up watching Little House on the Prairie and my kids grew up watching it too. I was so obsessed with Laura. As a child I wanted to be her friend. Lol! My mom even bought me a bonnet to wear and a Little House on the Prairie lunch box when I was a little girl. I’ve read the books which is awesome! I’m 39 years old and I’ll never get tired of watching the show! My family and I immigrated from Norway to Oklahoma City where, as an avid reader, I discovered The Little House on the Prairie books. My best friend and I would sew period clothing for our dolls and pretend they were the characters in the stories. At the age of 9 I wrote a long (11 pages!) fan letter to Laura telling her about my family, my special friend and our love for her and her books! I received a letter in return from Laura’s daughter, Rose, informing me that sadly her mother had died just a couple of years before. We have read the books to our grandchildren and this summer took them to Mansfield, Mo to see Rocky Ridge Farm and the museum. It was wonderful to step back in time and touch base with Laura’s history. Love LHOTP, watch the reruns over and over! Was great reading about Carrie’so life. Best information was, her husband and stepson working on Mt Rushmore, since I was just there with the grandkids, who also watch the show with me. I also own the CDs! The place could be Walnut Grove in Minnesota and the time of course, would be the 1930’s just before WW-II. I can just see Melissa Gilbert reprising her roll as Laura Ingals Wilder. There are some on YouTube, as well as in the extras of the LHOP DVD’s. I believe they were on the Today show. I just Love the show too! I’m just getting real info for first time! Now I’m wondering why Marry lived with Carrie? I thought she had the hardest life of all!!! I hope Adam didn’t leave her or die after he got his sight back! Also curious about Grace and all the adopted kids especially Albert. I have a feeling that Charles”PA” was a pretty strict dad and gives me that fire and brimstone feeling looking at him? Love finding this! A) Adam never existed in real life. Mary Ingalls never married. B.) Charles has a nephew named Albert in real life. But Pa and Ma never adopted any kids. Hollywood took alot of liberties. All the information about the family is always interesting. Sad to say I had not heard of the books until the TV show. Are there any living members of the family? Grand children, great, great-great grand children etc. I worked for Jim and Lois Engles here in Springfield Mo. Jim is a great cousin of laura Engles. He has the family tree hanging on his wall on their home. I own the books from buying them in the 1970’s through the Readers Digest. They are old and worn but I would never part with them. I live in Long Island New York State and every year in December when our cold weather is unbareable I read the Long Hard Winter. Knowing what the Ingalls went through in all those months I know I can make it through our months. Its great reading about all you people and finding out lots more about the Ingalls girls. 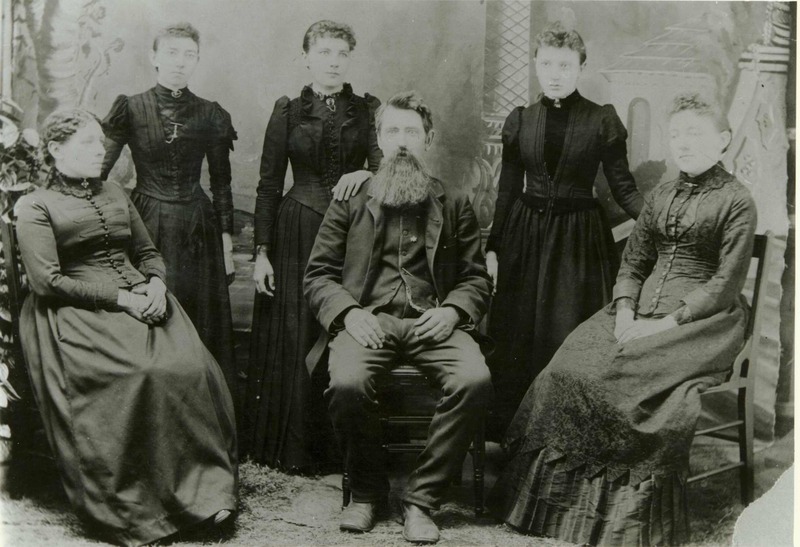 Unfortunately, there are no direct descendants of Charles and Caroline Ingalls. However, Charles came from a large family and they have many descendants, including me. In “Little in the Big Woods,” when the two Laura’s are arguing about which baby is prettier; that other baby is my great-grandmother Ruby Evaline Ingalls. I have grown up reading the books and learning what is true and what was made up or confused. That is so neat! What a great legacy for your family to be descended from the other pretty baby. I have a large extended family and love researching my ancestry. I’ve often thought I should write down all of the family stories, perhaps I will. I was blessed by having my wonderful teacher in fourth grade, Mrs. Isom, read the entire series of books to us throughout the year. Many of us in the class shed a tear when Laura and Almanzo married in “These Happy Golden Years.” Those were wonderful times and I am glad I was introduced to the books, have enjoyed reading them all these years and still do at age 65. One of my best school memories. When i was in the 4th & 5th grades my teacher read the entire series to us. That was approx. 48 years ago. Loved them then & now. The TV series was one of my all time favorites. Thanks for keeping the Ingalls family alive in our hearts & the hearts of future generations to come. I enjoyed the website very much. I have an MSW and am curious to know what a MASTER’s in Social Entrepreneurship is? Very good info about Carrie. I love learning more and more about Laura and the entire Ingalls family. Thank you so much for this site. My dream is to one day take my own LHOTP tour to all of these historical places. 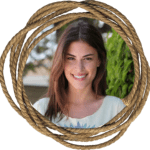 Hola, soy Sol desde mi niñez ame la familia Ingals…cuando me entere que la serie de Michael Landon estaba basada en una historia real ,escrita por la verdadera Laura Ingals…senti que ese mundo puro , lleno de valores y gente bella me llenaba de felicidad saber que vivieron y estan en mi mente y corazon , cada relato, foto que veo me llena de ganas de saber mas de cada uno de ellos y en especial de Laura y su soñada familia…gratitud inmensa a quien junto con ustedes nos regalan parte de algo maravilloso…con toda la tecnologia y avanses jamaz existira para mi una epoca mas dorada que la de la Familia Ingals…saludos . I watch the program every single day morning and evening and I am 69 years old. I’ve always loved Little House and wish I could watch it all over again. We don’t get the reruns or anything here where I live. I live on Prince Edward Island , Canada. Charlottetown actually and would love to have it shown here again. I have read the books so many times when I was growing up. I still look at the movie ? everyday. That and the Walton are two of my favorite shows. But I love Lucy and The little house on the prairie are my all time favorite. Carrie was not the baby in Little House in the Big Woods. Carrie hadn’t been born yet. total time adding up to be less than a year. Laura was born in “the big woods,” and the family moved to Kansas when she was around 2. Carrie was indeed born in the “little house in the prairie.” Then, when the family was forced to leave Kansas, they moved back to the Big Woods for awhile. It is during this period that the events that she wrote about in “LHITBW” occurred…so Carrie would have been there then. In her books, Laura’s Ingalls Wilder didn’t write about the two times she lived in the Big Woods, just the second time. So, the progression in the books was from there to the prairie to Walnut Grove. It’s confusing, but she did take some liberties with time and place to make a coherent, easy to follow story. Hope this helps clear up confusion! I love learning about the Ingalls family. I grew up watching and reading about Laura’s pioneer life. I would love to visit all the old home places talked about in the books. Thank you Laura Ingalls wilder for sharing your life with us. Thank you Laura Ingalls Wilder for sharing your life with us. Im a 43 year old man from El Salvador and i started watching LHOTP when i was maybe 5 yrs old when i still lived there. I arrived to the USA when i was 7 yrs and grew up watching it and now i love watching this wonderful show with my young daughters . Thanks to Laura Ingalls Wilder and of course Michael London for all your hard work to put it on tv for all to watch.